SINGAPORE - MP Lee Bee Wah has denied claims in an online report that she gave instructions to the centre manager of Yishun Stadium to turn the facility's floodlights off at 9pm on April 10. Two of the stadium's four floodlights were turned off at about the 69th minute of a Football Association of Singapore (FAS) Centre of Excellence (COE) Under-19 match between FAS' U-19 side and Warriors FC. The match was abandoned thereafter. "I did not give instructions for the match to be stopped. I am waiting for the report and statement from Sport Singapore (SportSG) before deciding on my next course of action," Ms Lee, Member of Parliament for Nee Soon GRC, told The Straits Times on Monday (April 16). The Warriors had posted a statement on Facebook on April 10 saying that the match in question had been "suspended in the 69th minute due to floodlight failure". Ms Lee referred to that in her own Facebook post just after 3pm on Monday. 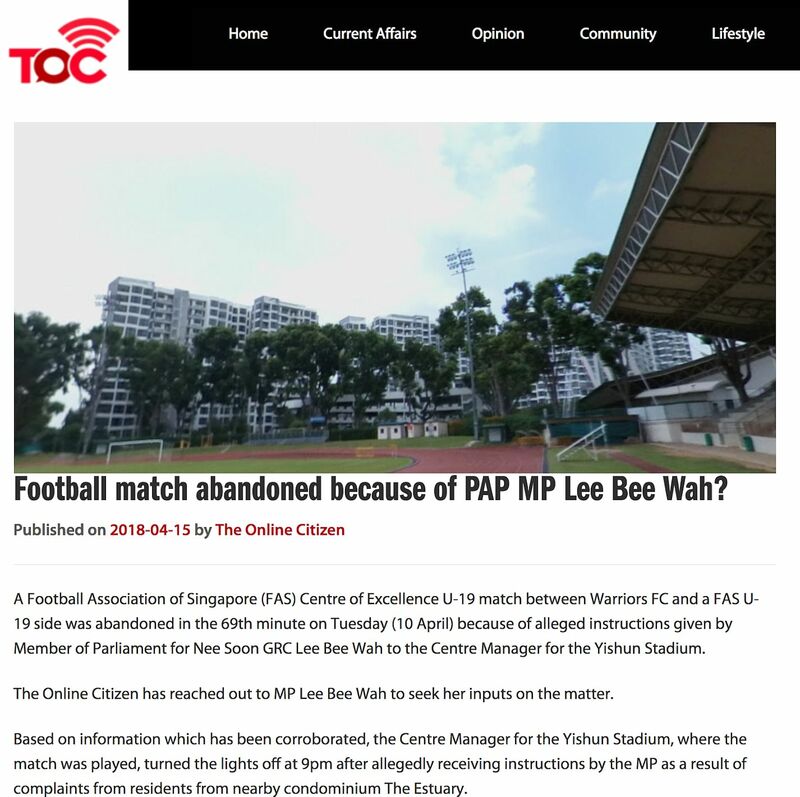 She said: "An article by The Online Citizen (TOC) alleged that I had ordered the floodlights at Yishun Stadium to be turned off after residents had complained about the glare. This is not true. "I do not even run Active SG or the stadium! Despite the Warriors FC post, TOC went ahead to post a falsehood. Unfortunately this is the danger of online falsehoods now." A parent of one of the players present at the game spoke to ST on condition of anonymity, revealing that the April 10 incident was not the first time that Yishun's floodlights have been turned off at 9pm. "FAS youth teams train at Yishun, and the lights have gone off at 9pm at some training sessions in the past, but this is the first time that this has happened in a match," she said, revealing that FAS technical director Michel Sablon was also present at the match. "At a training session, the coach can design workouts or even start earlier, but for this to happen in a match is shocking - everyone was looking on in disbelief. The question is: What will happen at future matches at the stadium? The season has only just started." Warriors' general manager Paul Poh corroborated the parent's assertion that the Yishun Stadium lights had been switched off at 9pm before. "This has happened before, and the FAS should be aware about it, because their teams train there. It appears that the lights are set on a timer, and the two lights facing the condominium (The Estuary) are turned off at 9pm, because of residents' complaints," he said. The youth Warriors have played matches at Yishun in 2017, without incident, but Poh could not recall when the 9pm cut-off started. This is not the first time residents have clashed with the users of a sports facility. Last year, usage of the two main football pitches at the Home United Youth Football Academy in Mattar Road was restricted, following complaints about noise levels from residents who live in the neighbourhood. Eventually, one of the facility's main tenants, football academy JSSL Singapore, relocated to The Arena in Woodleigh Park.